With the election looming and only days away, I am still concerned about the future of rural health and in particular rural mental health. Very little has been proposed about mental health, less about rural mental health, and even less about young rural people’s mental health. I think that is a big concern – the invisible problems that exist, still have very little political light shed upon them, or political will to improve the odds. Greens are a little more hopeful – while they too would seek to expand they headspace model – they are at least open to other models of care as well. The Greens have a rural mental health policy and seem to have listened to rural people about their issues, and are prepared to work with rural people to improve rural mental health. Importantly, and with a real point of difference, the Greens will expand the Mental Health Nurse Incentive Program. (http://greens.org.au/ruralMH). Over three-quarters (76.0%) of people who died by suicide were male, making suicide the 10th leading cause of death for males. 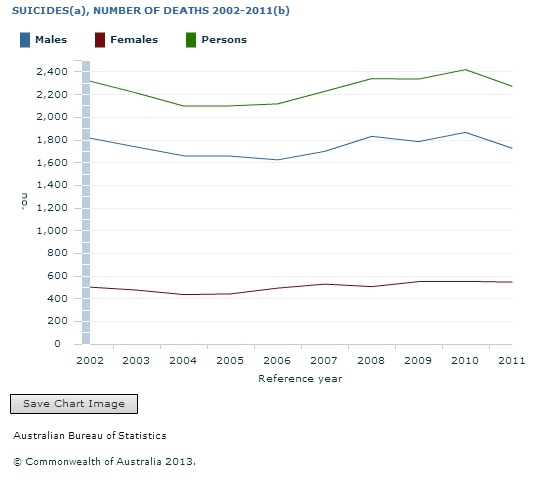 Deaths due to suicide occurred at a rate of 9.9 per 100,000 population in 2011. 65% of all mental illness starts during the ages 12-25 years of age –intervention needed during this crucial period. People in rural communities self-report that they experience mental illness and behavioural problems at a rate of 16 per cent higher than their urban counterparts (Australian Bureau of Statistics(ABS), 2011). Suicide rates among rural males, and especially young men aged 15–29 years, have been increasing over the past 20 years (Department of Health, 2013) and at rates twice as high as young men who live in urban communities (ABS, 2011). On average every year 12 class in Australia will have one student who has attempted suicide (Mendoza, J., Bresnan, A., Rosenberg, S., Elson, A., Gilbert, Y., Long, P., et al. (2013). Obsessive Hope Disorder: Reflections on 30 years of mental health reform in Australia and visions for the future. Summary Report. Caloundra, QLD: ConNetica.). Only one headspace in New England, NSW region – and it is new to Tamworth…. Solutions: My ideas for making some improvements in rural mental health….. Need a ‘headspace’ centre in every community. Headspace initiative is only OK if there is one in every community. The current plan is something like 90 nationwide…. Falls way short of need – and it’s not well suited to rural communities. Need to use rural nurses better – co locate nurses in schools, police stations, juvenile justice centre’s, and GP surgeries. 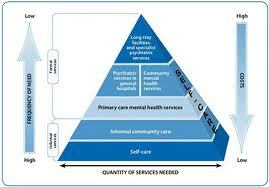 An extension of the mental health nurse incentive program (MHNIP) should accommodate this (medicare funded). But, with a focus on a gateway to mental promotion, helping at the emergent phases and to promote early identification and early intervention where it is needed. Youth mental health needs to be a priority – nationally because most mental illness starts during youth phase. Figure above World Health Organisation (WHO) pyramid for optimal mix off mental health services (brief online document in link below). I live in the New England Electorate – my choice of vote is limited by the strength of the candidates in my electorate (as is the case for everyone…..). My news and interaction with others about politics is mostly gained via social media (perhaps more so than any other election). I have made an attempt to contact (via twitter) all of the candidates in my electorate to understand their views about issues on which I base my vote – one of which is rural mental health. Twitter has been a significant medium in my political information gathering throughout the election campaign….. I have noted that some candidates have not engaged with constituents in that space – I think a little remiss in this day and age. Some have, only three candidates have a twitter profile,and only one seems to be engaged with the public in twitter….. releasing new information regularly about positions and views. I have made an authentic attempt to inform myself (and others) of key underlying issues about rural mental health generally, especially in regard to the real life experiences of people in New England electorate, without any coupling to a particular political persuasion. I don’t think there will ever be vast amounts of money to solve mental health problems in the bush – BUT I do hold out hope that we can use grass roots initiatives and community development/ social captical approaches to improve mental health and the environment in which people live in the bush – – I think nurses are pivotal for progress in that regard…. I’m not looking for quick fixes, glossy media moments about shiny new things – but I am looking for meaningful and innovative progress that is driven from a rural genesis…. and my voting decisions are influenced by this. My vote this election is influenced by my experiences as a rural mental health nurse. After a great deal of consideration – In the New England seat for me that will mean House of Rep’s – Vote 1 Rob Taber Independent; Senate – Vote 1 Australian Greens. I hope that this continues to develop stronger rural mental health support to rural people in the region where I live, work, help and nurse. I guess some people will think it odd to be so candid and transparent about voting – but, in doing so I hope this conversation helps others consider carefully how they will vote and the impact that their vote will have on the mental health of rural people too. I think it is part of my nurse character in some respects – coming up with new and vulnerable ways to advocate for the rural people that I have served in my nursing career so far, and demonstrating that I have really put some thought into the privilege that it is to vote in Australia. I will be interested to hear views from others – and especially rural mental health workers! The stats are damning Rhonda and I am not sure much will be done to help improve these stats unless it hits home personally. Where is the money that John Howard promised and KRudd recycled? It can’t have all gone into the new facility in Wagga. I work for a mental health triage line and the areas we cover are huge but extremely under resourced. One reads the waiting times, especially CAMHS and wonder if these clients will ever be seen. I agree, early intervention is the key and we need more nurses, but in my opinion that won’t happen until mental health is promoted as part of our overall well being in a much greater way and MH nursing is looked on as a little more glamorous. Rarely have I had a Grad Nurse come up to me and say this is the stream I wish to work in. Fantastic article, Rhonda. Food for thought. Nursing research will be doomed if LNP get in. Agree! We (nurses) are perhaps not political enough in describing how important it is that nursing research is fundamental in developing/promoting health and well being for now and the future (nationally and internationally)….. nurses know that – but we don’t do such a good job of making that known! I think we are still too busy sometimes cutting down our own nurse tall poppies – our politics has to evolve beyond eating our own to making some headway to advocate adequately for human health and well being…… and then there is the to cuts to humanitarian aid….. latest MDG reports show that child mortality, and hygiene and sanitation are still at below goal standards….. if we can’t get that right on a world scale…..and prioritize it as a wealthy nation, we can’t hope to make a much of a dint in mental health either…… nurses are health promotion experts….. gotta involve our selves more at all levels….. I think…. !